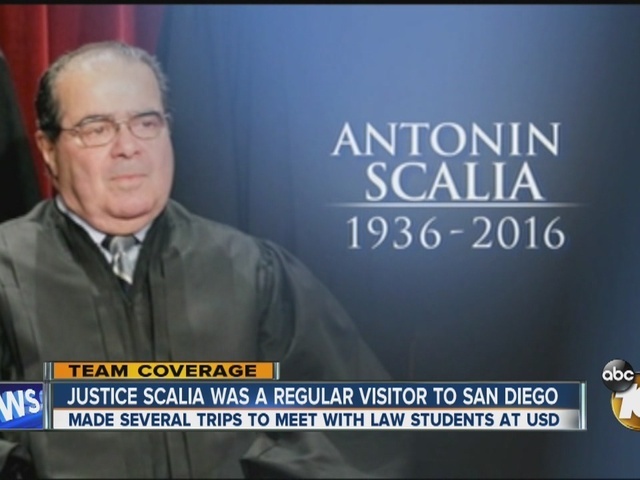 Justice Antonin Scalia will be missed in San Diego. He made many trips to meet with local law students over the last several years. He was good friends with many at USD's School of Law, and every few years he would come to visit. Professor Michael Devitt said students got to see a softer side of Scalia. "I'm sad, I think the whole country should be sad," said Devitt. Scalia also had a relationship with the Thomas Jefferson School of Law. The school issued a statement reacting to the death of U.S. Supreme Court Associate Justice Antonin Scalia, who was scheduled to teach a class for the school this summer in France. "We are deeply saddened by the passing of Justice Antonin Scalia. His service to Thomas Jefferson School of Law contributed to the betterment of our students' education," Dean Thomas Guernsey said in the statement. "Our students shared inspiring stories of learning constitutional law from Justice Scalia, a leading intellectual on the subject. The legal education community has lost a good friend." Justice Scalia's class was scheduled for Nice, France June 26 through July 21 as part of the school's study abroad program. It would have been his fifth for the school. Rep. Darrell Issa, a Republican, also released a statement praising Justice Scalia. "I am deeply sorry to hear of the passing of Justice Antonin Scalia. This is a profound loss for the Supreme Court and for the United States of America," Issa said. views were firmly anchored in the Constitution and its fundamental guarantee of liberty. When he roared, which he often did, you were wise to take notice. "There was no one more in tune with recognizing the importance of the Constitution's original intent and refraining from legislating personal views from the bench than Justice Scalia and the next justice must respect the Constitution in the same way."